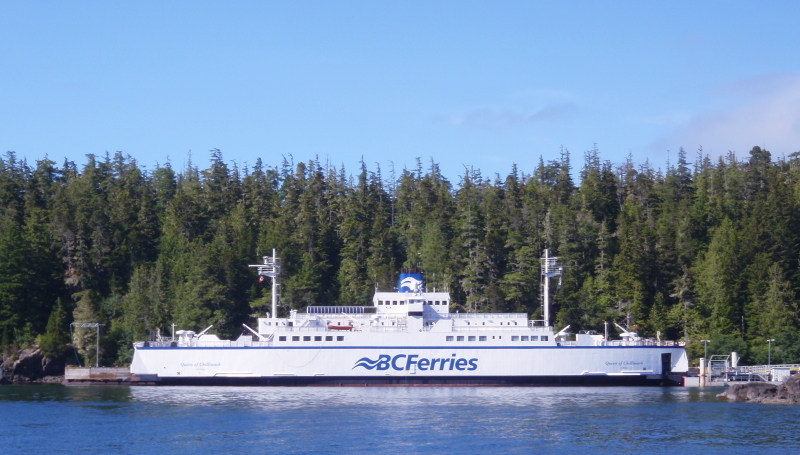 In the afternoon, I hit the coin-op erated showers on the ferry for a final hot wash before several weeks in the bush. I emerged to find the skies had cleared again and the wind was blowing strong from the south. We landed at Klemtu about 15:00 hours. By the time I’d wheeled out and repacked the kayak, it was nearly 17:00, but that was ok, as it took that long for the rising tide to make the rocky foreshore launchable. With the help of a couple of passing German tourists, I slid my heavily loaded boat into the water. The south wind let me make an impressive sailing exit from Klemtu, then died after about a mile. Oh well, at least I was around the corner by then, so my shame was hidden from the ferry passengers and village populace. Plus, there were confusing seas bouncing off Swindle Island that would have been worse in a strong breeze. I made the turn into Myers Passage about 19:00 hours, and landed at my first campsite, a steep beach of broken shell, about a half hour later. The serrated surface made me glad to have my heavy-duty homemade footprint shielding my tent floor from punctures. I fired up my little folding woodstove to cook dinner. The freeze-dried Shrimp Kun Pao was hot and filling, but rather meh taste-wise. I comforted myself with the certainty that better meals awaited, then took refuge in the tent from the bugs. I updated my journal as the rain pattered softly on the roof ̶ how considerate of it to wait til all my outside errands were complete. My sleep was filled with weird dreams of magic and witchcraft. Though I’d drifted off with my sleeping-bag draped duvet-style over me, the pre-dawn chill shivered me awake, and I zipped it into full mummy-bag mode. The steep slope of the beach made launching easy ̶ no chasing or fleeing from the tide as I loaded the boat ̶ and I was underway just after 9AM, paddling through light rain and a slight headwind. 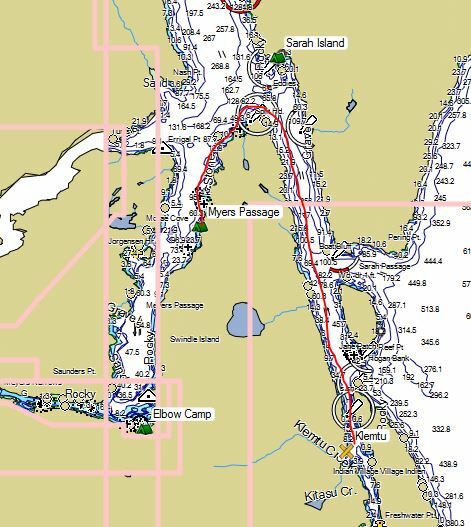 I transited Myers Narrows without incident, getting a bit of a boost from the current. 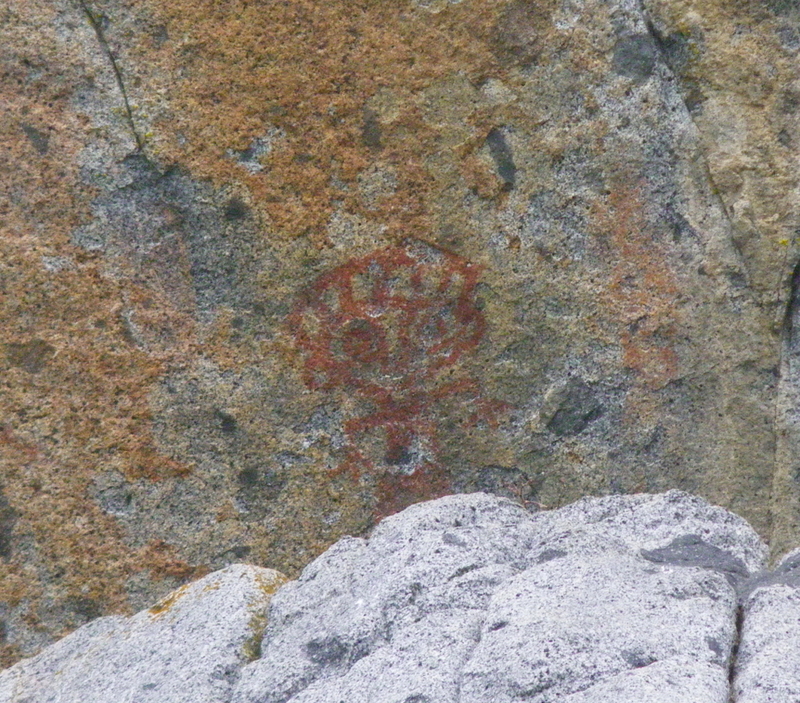 Just beyond the Narrows, I found a petroglyph. 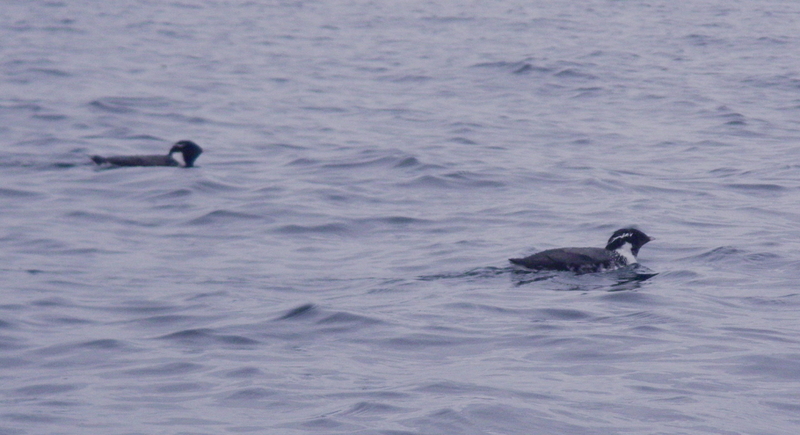 About 14:00 hours, I emerged from the west end of Myers Passage, and landed on Milne Island a couple of hours later. This spot turned out to be one of my favourite camping sites of the whole trip. The area is popular with tour groups, but I had it all to myself this night and the other two I spent here later. Near my tent, I found what anthropologists call CMTs: Culturally Modified Trees. The First Nations people took strips of bark from living cedars to weave all kinds of useful artifacts, including the conical hats that preceded Gore-Tex sou’westers as paddling headgear for the Pacific Northwest. It’s a technique that’s being revived as many bands work to preserve traditional knowledge and languages. Older CMTs have helped natives establish proof of their presence in territories prior to European contact ̶ vital evidence as they assert their land claims in negotiations and court cases. 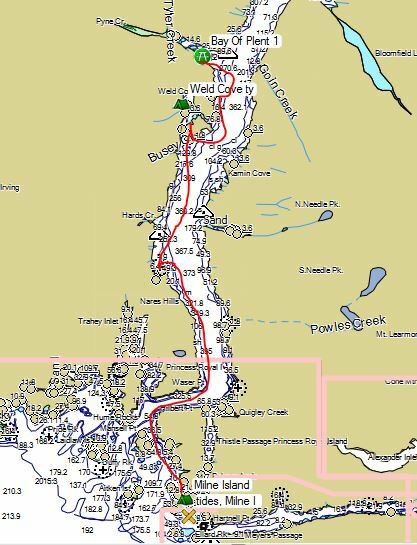 I set off up Laredo Inlet, supposedly prime white bear watching territory. 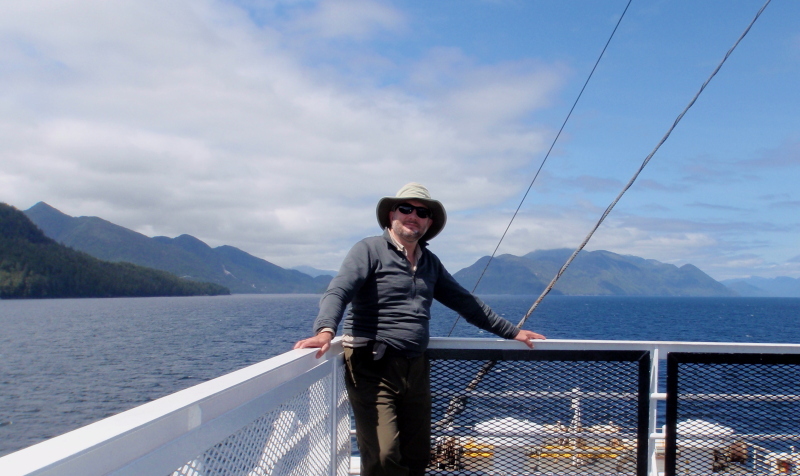 Enroute, I felt the outer coast swell for the first time on this trip, though greatly attenuated by Aristazabal Island. I didn’t see any bears in the inlet, but I did have a pod of Orca come by. Shortly afterwards, the vague aches and nausea I’d attributed to age and easing back into long days of paddling escalated to full-on vomiting. It’s a bit challenging to keep your paddling rhythm when it’s “stroke, puke to port, stroke, puke to starboard…” Landing spots are few and between around here, so it’s a good thing the headwind died, as I was paddling with the strength of a child. Also a good thing I was paddling in the sheltered inlet and not outside on the swells, as my sense of balance was severely addled. A roll would have been out of the question, and even a paddlefloat re-entry would have been a dubious proposition with my shaky arms and wobbly legs. Fortunately also the problem appeared to be bad food (dried potatoes or cooking oil from my breakfast) not bad water, since it was not attempting to break out at both ends, so to speak. After what felt like forever, but was probably an hour and a bit, I found a rough landing spot and was able to pop a child’s Gravol. 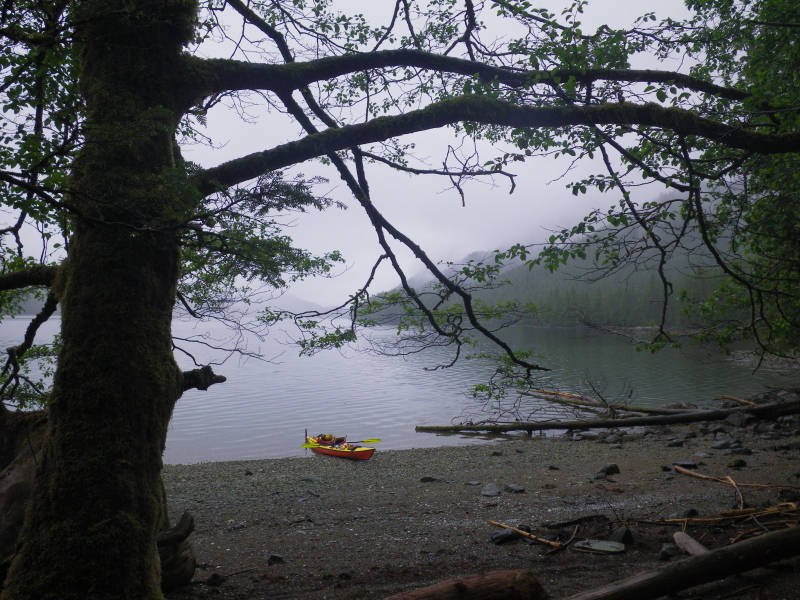 By this time, I’d puked up all the bad stuff, and the rain was washing refreshingly over my face, so I reboarded and carried on into the Inlet. The wind even reversed, and let me paddle-sail for an hour or so. Pulling into Weld Cove about 17:15, I spotted a boat I recognized. 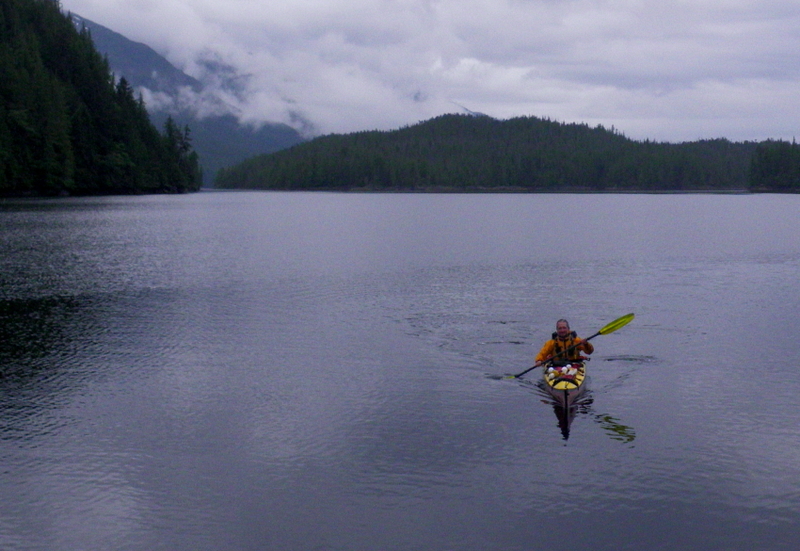 Back in 2001, I’d attempted to paddle from Prince Rupert to Klemtu. A few days out of PR, I’d been pinned down by a week of the worst weather in three decades, which chewed up all my safety days. I’d reluctantly made the decision to retreat to PR. 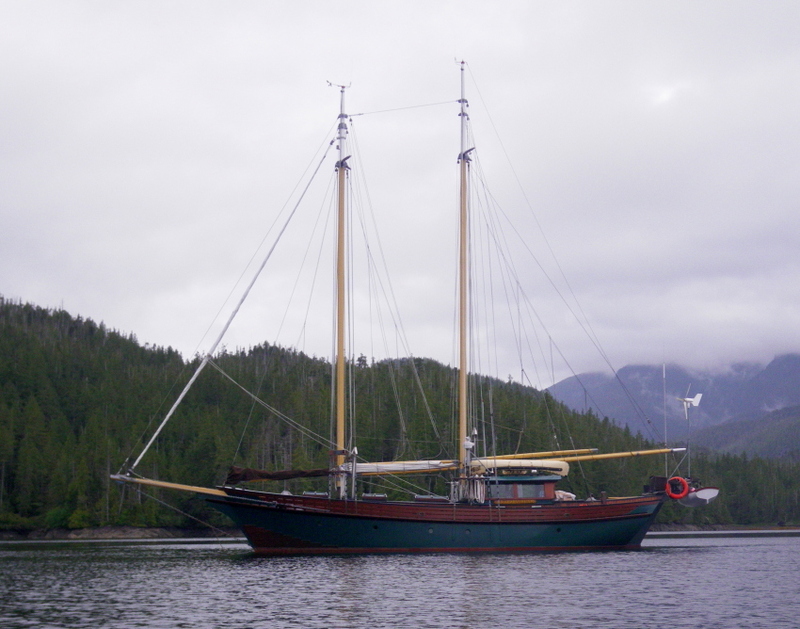 A day later, I was picked up by this boat, The Grizzly Bear, and given a lift back. It was a bright spot in an otherwise discouraging trip, since I love sailboats, especially hand-built wooden beauties like this. It turned out the couple who were so kind to me had sold the boat about five years back, but the current owners were in touch with them, so they promised to pass on my best wishes. The camping options at Weld Cove were a choice between plain lumpy grass hummocks or soggy lumpy grass hummocks, so I carried on to the entrance of the Bay Of Plenty. Even here options were few. 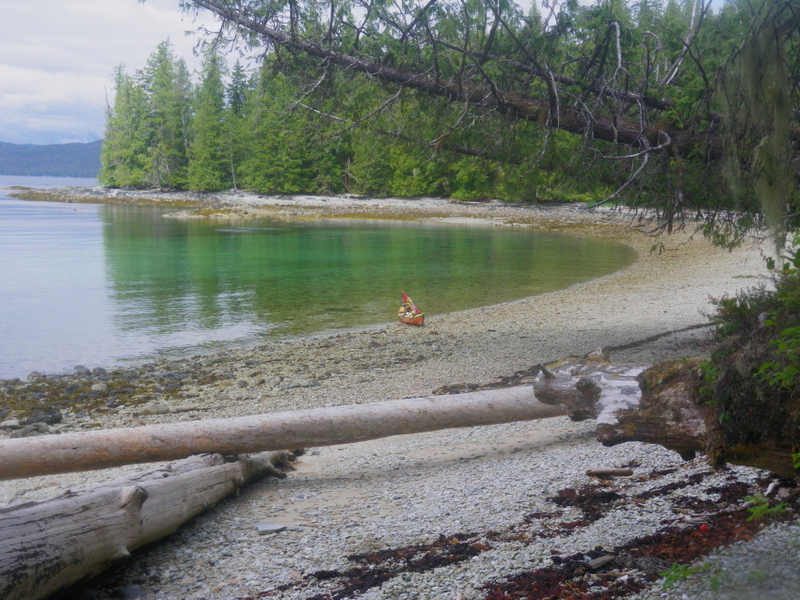 I finally had to pull up on a tiny beach, lean my erected tent over a driftwood log and wait until midnight for the tide to turn and drain a small rock shelf where I could lay the tent flat. Meanwhile, I had supper – my first food since breakfast more than twelve hours earlier. 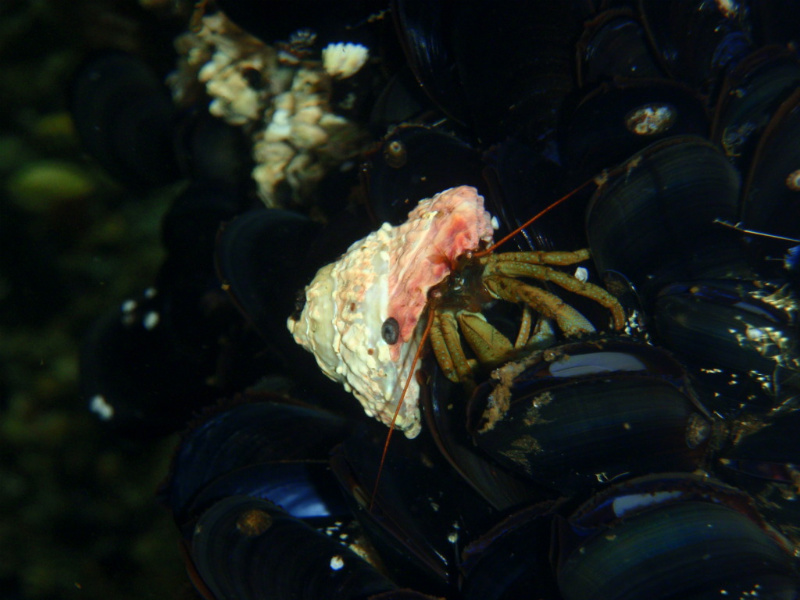 And breakfast hadn’t really counted, since it had only been on loan before its projectile return to the sea. As I crouched in the rain in my wetsuit, fending off bugs, I consoled myself with the thought it was a good thing my wife wasn’t with me on this trip. She’d have been paddling back to The Grizzly Bear and filing for divorce via VHF. I did sleep well once I got belatedly to bed. This morning, I paddled into the Bay Of Plenty. 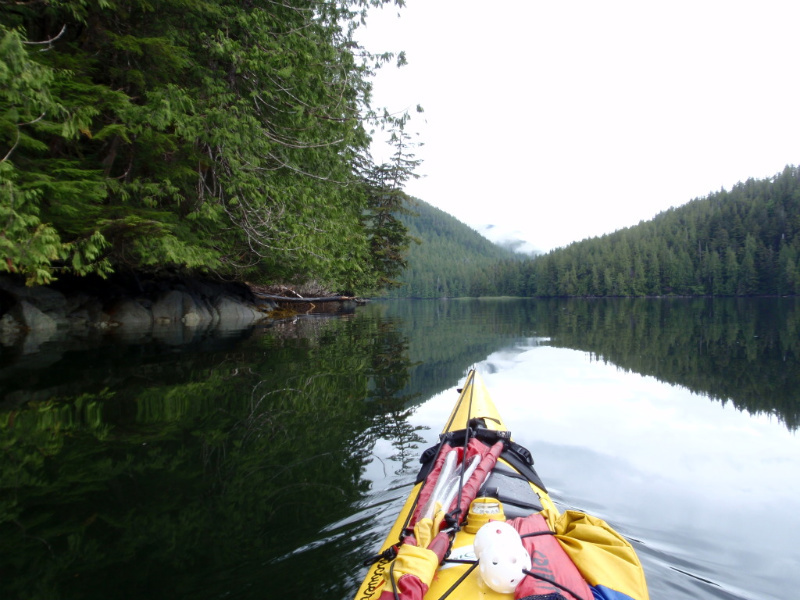 It was like paddling into a painting – high peaks and gently swirling mist. Hope and anticipation turned every fallen tree and hillock into a maybe bear. Sadly, they were all phantoms, but I did get to fill my bags with sweet, clear water from Pyne Creek. The trip back down the inlet was long and against the wind. But even in this landscape of grey skies and green trees, there were flashes of vivid colour, though you had to look below the surface to find them. Just after I exited the inlet, I got hammered by a severe headwind and rain squall. I was afraid I’d have to claw against it all the way back to Milne Island, but it only lasted about fifteen minutes. I landed at 19:35, just before dark. 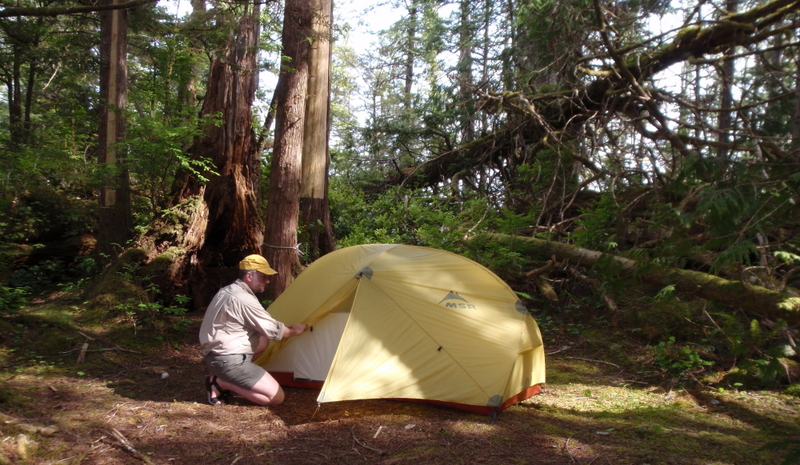 I was once again grateful for the fast set-up of my tent. 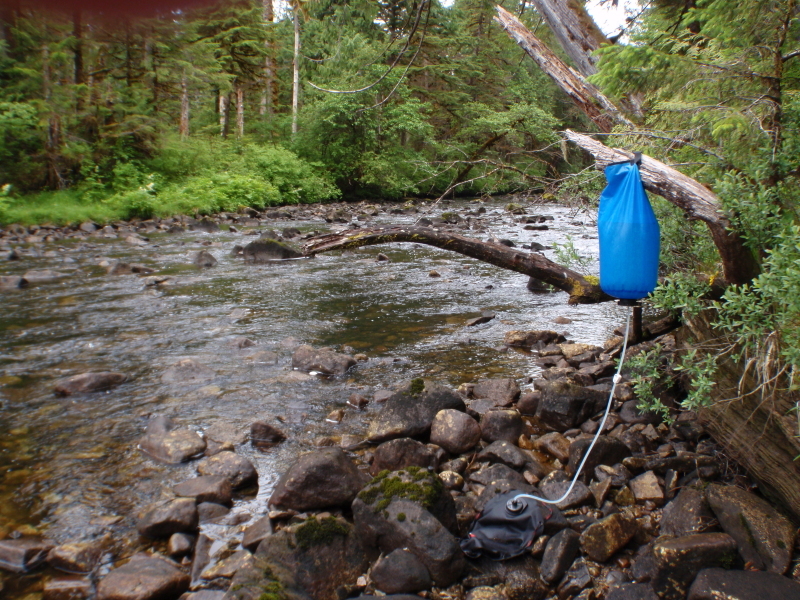 I rigged my tarp for the first time on this trip, just before the rain began to pour again in earnest. 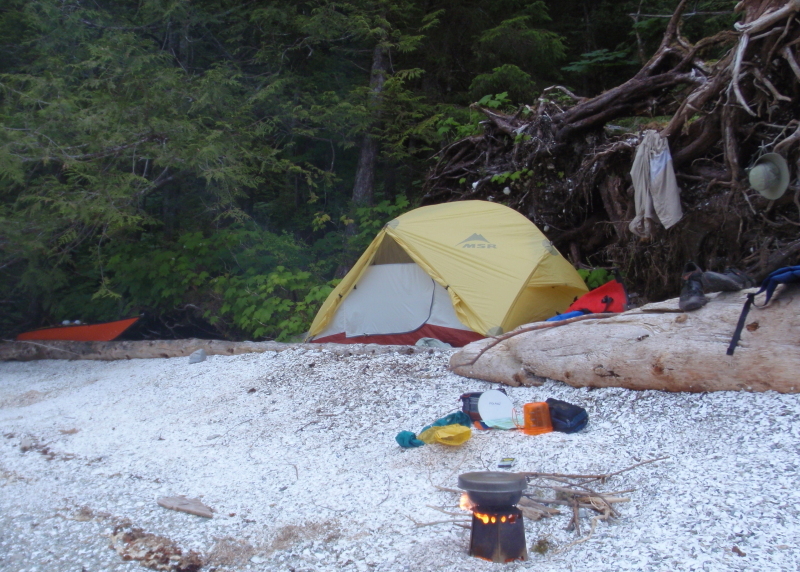 It’s hard to put into words how vastly content I was to eat my freeze dried sweet n’ sour chicken, watching the darkling sea and listening to the tattoo of the rain on my tarp and the boom of the surf on the nearby islets, knowing I was safe, and that a dry warm bed, level and safely above any tide awaited. This feeling of peace and joy followed me into the tent. 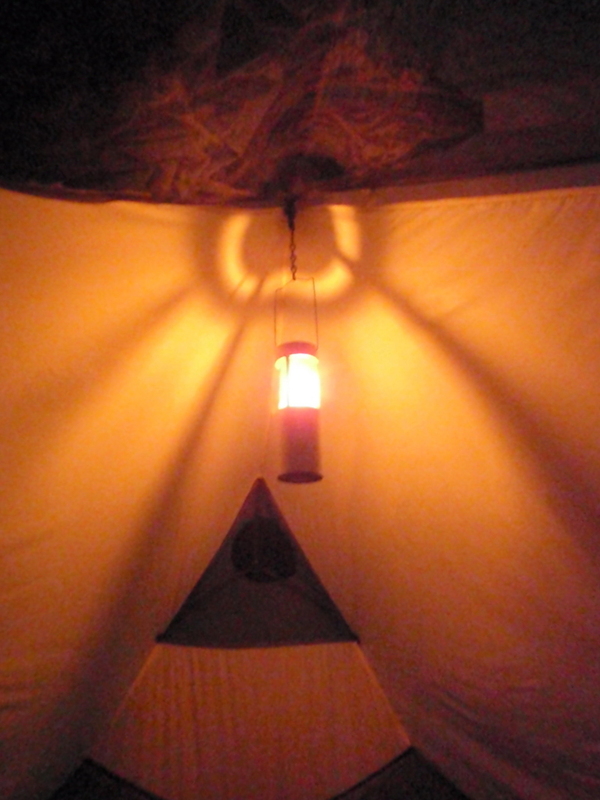 Though I usually read in bed, I simply watched the hypnotic flicker of my candle lantern and listened to the sigh of the wind in the trees until I dropped off. After the previous long couple of days, I declared a rest and recovery day for the full crew of the ship. 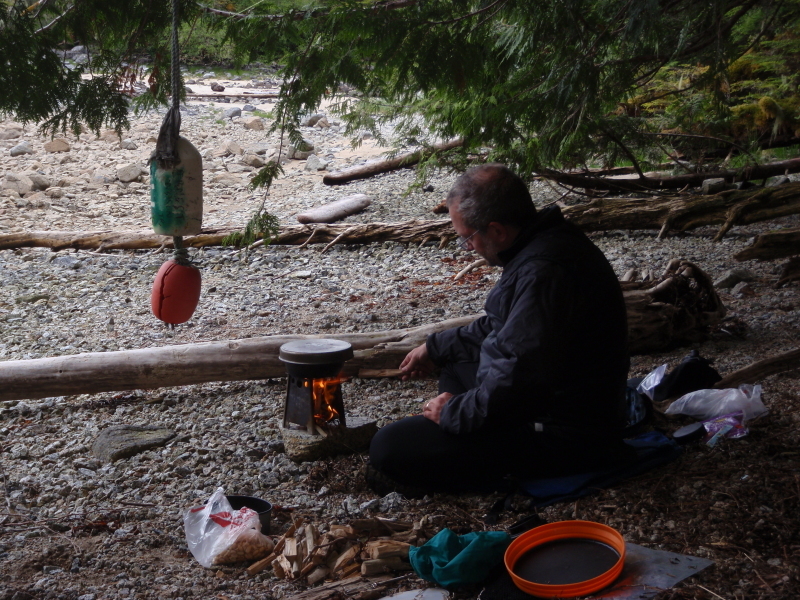 I didn’t paddle, I just read, hung out, sawed a pile of fuel for my woodstove, and then let myself be warmed and mesmerized by the flames as I cooked dinner. After a day off, getting up early was easy. There was a bit of rain and mist as I set out, but not so much I couldn’t navigate by chart, compass and Mark I eyeball. 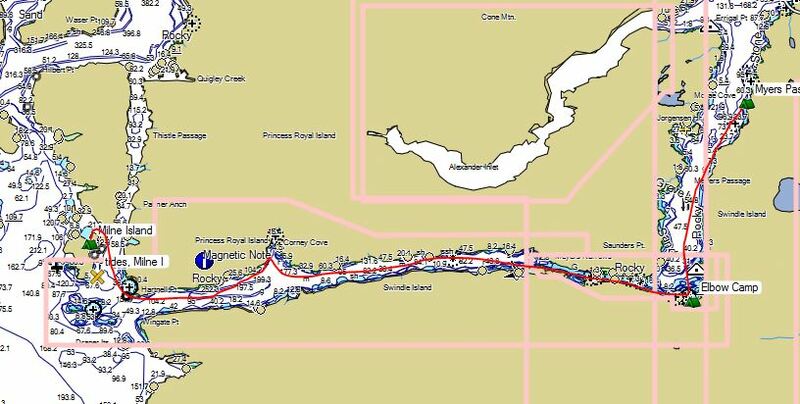 I completed the crossing to Aristazabal Island, making landfall near Fernie Point. 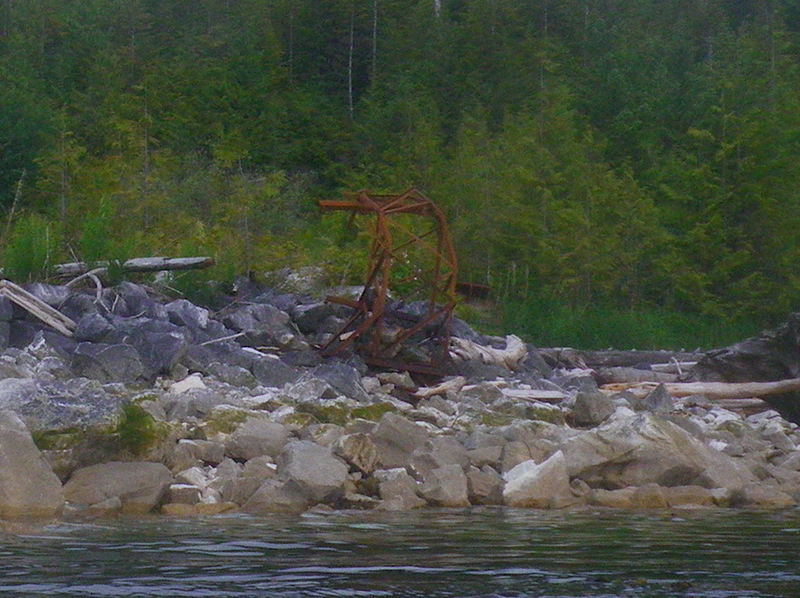 Just north of the point, I spotted the rusty remains of the limestone quarrying operation that ran here decades ago. Near the Ramsbottom Islands, the wind picked up enough to let me sail for a while. 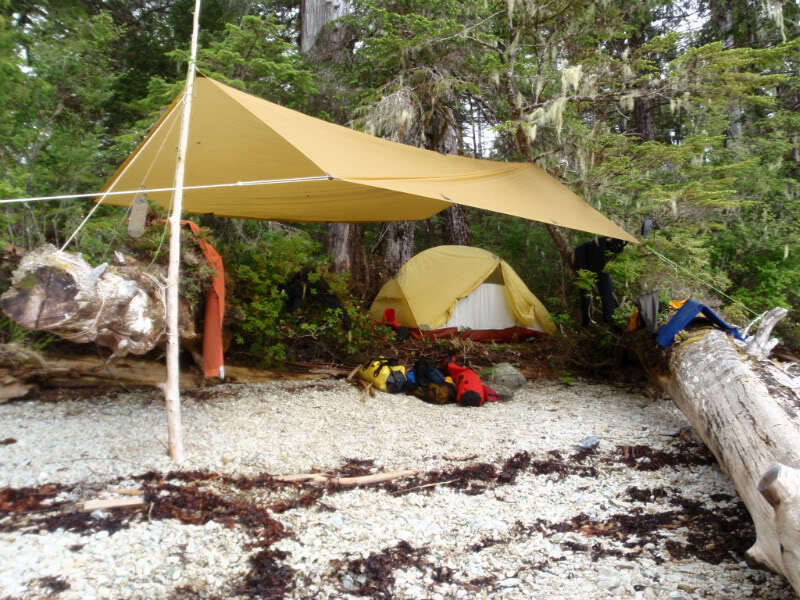 Thanks to J.K’s The Wild Coast, I found a snug campsite at Hawkins Point. 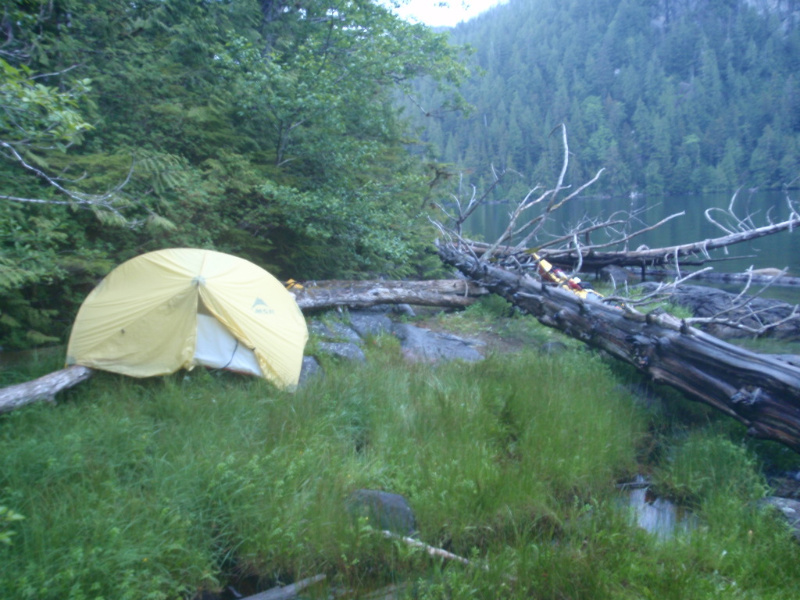 There were two tiny sites cleared in the upland: one took my kayak, the other just fit my tent. It was warm enough I could wear sandals only as I unloaded the boat and made camp – nice to let my body breathe after the muggy confines of the wetsuit. I rigged the tarp, but more as an engineering challenge and to give it a chance to dry than out of any immediate need for protection from the elements. It was Italian night at Filippo’s Seaside Ristorante: Dried Tortilleini cooked on my wood-fired stove and coated in primo olive oil, followed by freeze-dried Neopolitan ice cream. Too bad there hadn’t been room in the boat for a bottle of Valpolicella. Today’s weather menu featured strong winds from the north, rain, and highly variable visibility – not what I needed for the 13 nautical mile crossing to Campania Island. 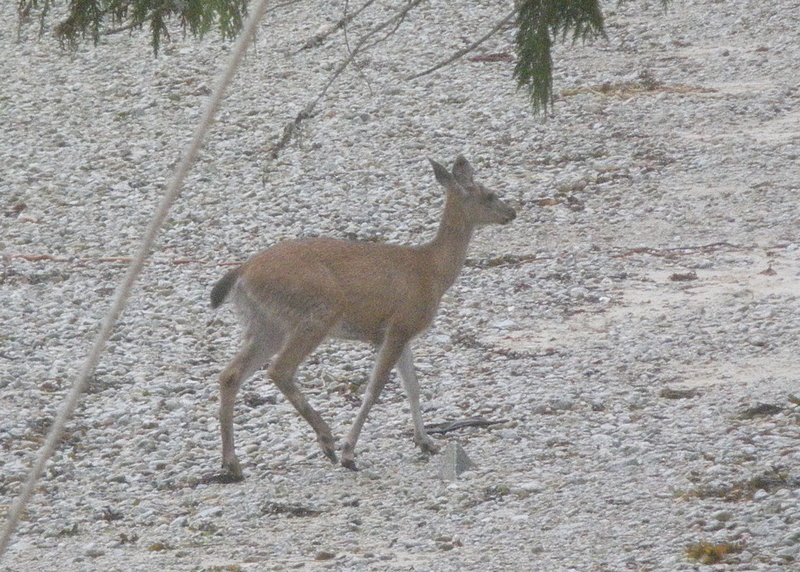 So I hung out under my tarp, read, and enjoyed the company of my woodstove and passing deer. The second chapter of this story is here. 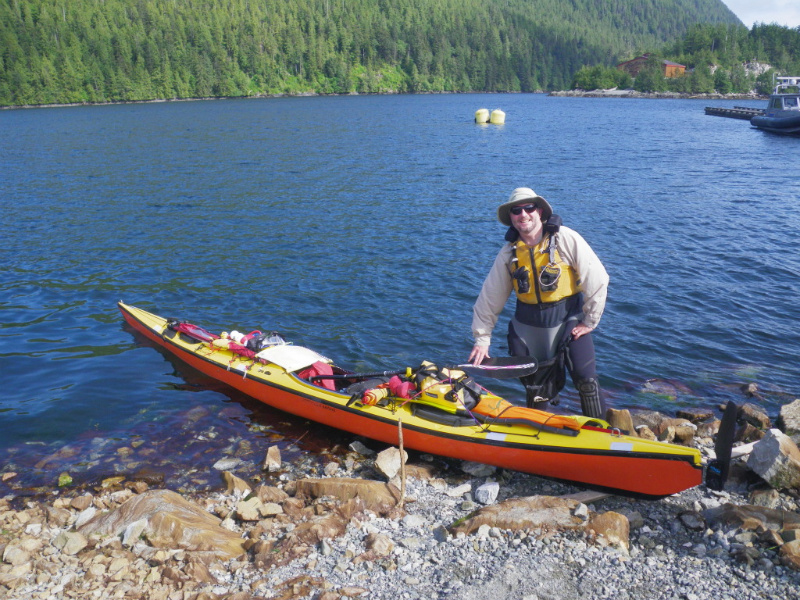 This entry was posted in expedition kayaking, kayak camping, kayak touring, Killer Whales, orca, sea kayak, Sea Kayaking, Tents and tagged Aristazabal Island, British Columbia, Camping, expedition kayaking, Great Bear Rainforest, kayak camping, kayak sail, Kayak Sailing, kayak touring, Killer Whales, Orca, Princess Royal Island, sea kayak sailing, Sea Kayaking, Tents, woodstoves by Philip Torrens. Bookmark the permalink.